Immunotherapy is a type of treatment designed to boost the body’s natural immune system to fight diseases like cancer. It makes use of substances either made naturally by the body or those developed in the laboratory. In the case of cancer, immunotherapy is used in different ways. While some aim to enhance the immune system generally, others train it to directly destroy cancer cells. Electron microscope of a human T lymphocyte (T-cell). Such cells are the foot soldiers of the immune system which some immunotherapies harness to fight cancer. Credit: NIAID/NIH. In 2013 cancer immunotherapy was named the scientific breakthrough of the year by the prestigious American journal Science. This was based on news that patients in clinical trials with cancers that are hard to treat, such as melanoma and lung cancer, responded positively to a new type of immunotherapy, known as immune checkpoint inhibitors. This is designed to block a biological pathway which cancer cells use to bypass the immune system and so prevent their destruction. By 2016, three checkpoint inhibitor drugs had been approved for market by the US FDA: ipilimumab, pembrolizumab and nivolumab. Pembrolizumab is known to have saved the life of Jimmy Carter, the former president of the USA, whose melanoma spread to his liver and brain. While immune checkpoint inhibitors have become some of the highest profiles of immunotherapies, many other immunotherapies are now on the market. More than a dozen immunotherapeutic agents have been approved todate to treat 10 different cancer types. In addition to those on the market, many immunotherapies are undergoing clinical trial. In 2013 approximately 800 clinical trials of immunotherapy were listed on ClinicalTrials.gov for a variety of cancers. These included breast, colon, head and neck and kidney cancers. Just how important the field has become can be seen from the fact that in 2016 pharmaceutical analysts estimated the global cancer immunotherapy market to be worth USD 61.97 billion and that it would reach 119.39 billion by 2021. At the end of 2016 GBI Research calculated that there were 2,037 products in development. This comprised 37 percent of the entire oncology development pipeline. The idea of using the immune system to fight cancer has a long history. As early as the 1700s a number of clinicians observed that some cancer patients who experienced a fever from an infection experienced a remission. In 1725, for example, the French physician Antoine Diedier noted that syphilitic patients developed very few malignant tumours. Subsequently, in the 1860s two German physicians, W. Busch and Friedrich Fehleisen, separately noticed that tumours shrank in patients who accidentally contracted erysipelas, a skin infection. Based on this observation and the success of the smallpox vaccine, both Busch and Fehleissen both attempted to treat a small number of patients with inoperable cancer between 1868 and 1882 by deliberately infecting them with erysipelas. Fehleissen reported tumour shrinkage in three out of his seven patients. Both of the German physicians pursued their experiments with no knowledge of the streptococcal organism that causes erysipelas. The first time a cancer patient was deliberately given the organism to induce erysipelas occurred in 1888. This was carried out by another Germany physician P. Bruns. It again shrank the tumour. Three years later, in 1891, William Coley, a surgeon based at Memorial Hospital in New York, also began injecting the bacterial agent for erysipelas into patients with sarcoma, a rare form of cancer that can develop in the bone and muscles as well as other parts of the body. He did this after finding the case notes of a patient in his hospital who had survived four episodes of recurrent inoperable sarcoma of the neck following a severe erysipelas infection. He had also spotted 38 similar cases in the medical literature. By the time of his death, in 1936, Coley had his colleagues had treated nearly a thousand patients using 13 different vaccine formulations. One of these they reported effected a cure in 60 out of 120 patients. Coley believed the success of the treatment was due to the bacterial origins of the cancer. His approach, however, had been largely abandoned by the 1940s due to the fact that Coley had never systematically tested his method or codified its application. In addition it had unpleasant effects. Erysipelas was not the only type of bacterial vaccine tested to treat cancer. In 1929 Raymond Pearl, a researcher at Johns Hopkins Hospital in Baltimore, observed from 1,632 patient autopsies that the incidence of cancer was much lower in patients with tuberculosis. Pearl soon persuaded one of his clinical colleagues to conduct a small trial with the BCG vaccine, first developed to prevent tuberculosis in 1921. While only a few patients were treated, the trial results were promising. Confidence in the vaccine was however shattered in 1930 when over seventy children died from a preparation of the vaccine which contained a virulent strain of tuberculosis. It would take many years before the vaccine would again be explored for treating cancer. The vaccine was finally approved in 1990 for the treatment of superficial bladder cancer. Vaccines were not the only approach attempted against cancer early on. So too was the injection of blood serum. This approach, known as serum therapy, followed the joint discovery in 1891 by Emil von Behring and Kitasato Shibasaburo, respectively German and Japanese physicians at the Institute for Infectious Diseases in Berlin. They found that serum taken from animals suffering from diphtheria and tetanus conferred immunity to other animals not exposed to such diseases. Soon after the German physician Paul Ehrlich, isolated a substance in blood he called ‘antibodies’ which provided immunity against plant poisons. By 1895 Jules Bordet, a Belgian immunologist and microbiologist, had detected another substance in blood, later named ‘complement’, that acted as an accessory to antibodies in destroying bacteria. The new knowledge paved the way to the successful development of a serum therapy for diphtheria. Developed by Behring and Ehrlich in 1893 this used serum from horses immunised against diphtheria. In 1895 Jules Hericourt and Charles Richet, two French physicians, reported positive results from two cancer patients injected with serum taken from a donkey and two dogs immunised with an extract of a human osteosarcoma tumour. Over the course of the next two years they had managed to treat a further 50 cases with similarly promising results. The use of serum continued to be investigated for treating cancer by other researchers into the early twentieth century, but with varying results. Despite their potential, both vaccines and serum therapy had been largely discarded by the 1930s. This was in part due to the rise in radiotherapy and chemotherapy. But it also reflected a more general scepticism within the scientific community about the extent to which the immune system could recognise and destroy malignant tumours. Knowledge about the immune system and cancer entered a new phase during the 1950s following the development of new inbred strains of laboratory animals. One study in particular, published in 1957 Richmond Prehn and Joan Main, based at the US Public Health Service Hospital in Seattle, helped transform the field. Critically they demonstrated for the first time that tumours carried specific markers, known as antigens, which the immune system could recognise and attack. Two years later, another study by Lloyd Old and colleagues at the Memorial Sloan Kettering Cancer Center, New York, demonstrated that mice could be immunised against their own tumours by injecting them with the BCG vaccination against tuberculosis. They discovered that the vaccine activated macrophages, a type of immune cell, which inhibited and destroyed tumour cells. By 1959 a new concept, known as immunological surveillance, had emerged, based on the new animal studies. This was developed by Frank MacFarlane Burnet, an Australian immunologist. He suggested that the immune system regularly screened and protected the body against tumours and that cancer only developed when the immune system acquired a tolerance to the cancer cells which allowed them to escape destruction, and to proliferate. Based on this hypothesis, Burnet argued that one way to combat cancer would be to find a way of increasing the immune system’s sensitivity to minor deviations from the body’s own cells. His theory reinvigorated interest in immunotherapy. The field, however, suffered a temporary setback following a study published in 1975 by Osias Stutman and colleagues at the Memorial Sloan-Kettering Cancer Center which did not find the incidence of cancer to be any greater in mice genetically bred with an inhibited immune system. It was subsequently shown that the immune system of the mice had not been as inactive as once assumed. The field would once again come alive after 1982 when Aline Van Pel and Thiery Boon at Sloan-Kettering demonstrated in mice that the antigens on tumours were often too weak to stimulate an effective immune response, but that it was possible to enhance the immune response of the mice by injecting them with tumour cells genetically modified to increase their antigenicity. In addition to the new evidence emerging from animal studies, immunotherapy was beginning once again to be tried out at the clinical level using a number of newly identified substances secreted by the immune system. One of the first to be tested was interferon. This substance, also known as a cytokine, had first been identified in 1957 and shown to suppress the growth of tumours in the late 1960s. Yet its therapeutic testing was initially hampered by the fact that it was difficult to produce. This all changed following the development of recombinant DNA and monoclonal antibodies which paved the way to the large production of interferon for the its testing in clinical trials. By 1986 enough data had been collected for the FDA to approve interferon for the treatment of hairy-cell leukaemia. It was the first immunotherapy to receive formal approval for cancer. Four years years later, the FDA approved another cytokine, interleukin 2 (IL-2), for the treatment of advanced kidney and skin cancer. By the 1990s a new class of drugs had begun to emerge for immunotherapy using antibodies, a type of protein that the immune system uses to neutralise harmful agents. Antibodies had first been demonstrated to a powerful weapon for treating lymphoma in 1980, but it was difficult to produce standardised antibodies that could bind to a particular target. This all changed as a result of a new a technique, published in 1975 by Cesar Milstein and Georges Kohler, which facilitated the large-scale production of standardised and highly specific antibodies called monoclonal antibodies (Mabs). One of the first immunotherapy drugs using Mabs to be approved was rituximab. This was licensed by the FDA, for non-Hodgkin’s lymphoma in 1997. The drug is designed to lock on to CD20, a particular marker found on the surface of B lymphocytes involved in the cancer. 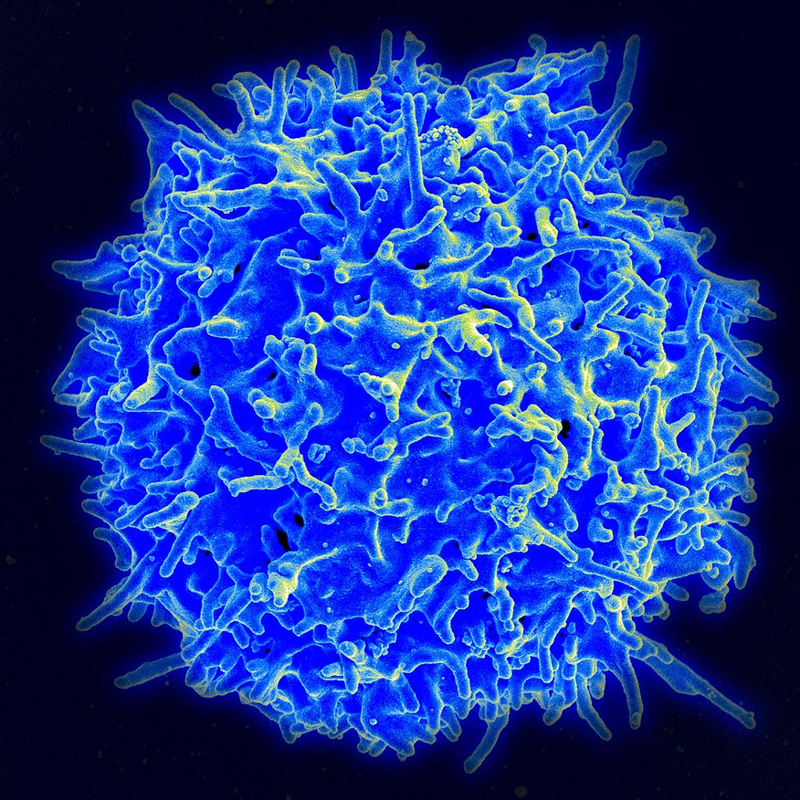 Once the antibodies bind the B cells, other immune cells will move in to destroy them. Since the approval of rituximab, many other immunotherapy drugs have been developed using Mabs. One of the reasons Mabs have proven so important to immunotherapy is because they are so versatile. Not only can Mabs bind to tumour cells and thereby signal various immune cells to attack them, they can also be used to prevent a tumour cell getting access to growth factors or inhibit the formation of new blood cells that tumours need to grow. They can also be used to block the mechanism tumour cells use to inhibit an immune response. This last mechanism is addressed by a new class of drugs, known as immune checkpoint inhibitors which are now a promising new field in the treatment of cancer. The first immune checkpoint inhibitor drug was approved for the treatment of metastatic melanoma by the FDA in 2011. Another type of immunotherapy currently under development today is adoptive cell therapy (ACT). This technique was born out of the observation in the 1960s that certain white blood cells, known as cytotoxic lymphocytes, destroyed cancer cells in test tubes. A key pioneer of the technique was Steven Rosenberg at the National Institute of Health who in 1985 reported the successful treatment of melanoma patients with repeated infusions of a sub-population of cytotoxic lymphocytes directed against tumours isolated from human blood that had been incubated with IL-2. While shown to be promising, the steps involved in the development of the treatment proved time-consuming and expensive limiting its adoption. A number of improvements were made to ACT over the years. One of the major breakthroughs was the development of chimeric antigen receptors. This was pioneered by Zelig Esshar and colleagues at the Weizmann Institute in the 1990s. It involves fusing portions of the T cell receptor with antibodies that recognise tumour antigens, or with other molecules that bind to specific markers on tumour cells, to increase the capacity of the T cells to destroy the cancer. It would take the scientists another twenty years to learn exactly how to use the technique for effectively treating cancer and control its side-effects. By the mid-2010s, however, millions of dollars of investment were being poured into the what had come to be known as CAR-T therapy. As of March 2017 there were nearly 300 clinical trials with CAR-T therapy. The treatment involves extracting T cells from a patient’s blood and then genetically modifying them to express the chimeric antigen receptor. The cells are then reinfused back into the patients after being multiplied in the laboratory. In August 2017 the FDA Oncologic Drugs Advisory Committee approved CAR-T therapy (CTL019, tisagenlecleucel) for the treatment of children unresponsive to traditional treatments for B-cell acute lymphoblastic leukemia. This was based on the results of a clinical trial with 63 patients between April 2015 and August 2016. More than 82 per cent of the patients went into remission. While promising, the treatment carries the risk of potentially fatal side effects such as cytokine-release syndrome and neurotoxicity. In addition the treatment is expensive because each batch of the drug has to be tailored to each individual patient, a process that can take several weeks to complete. By 2015 more than 25 cancer immunotherapies had gained regulatory approval. The majority have been approved in the last decade. Many different types of agent are used in these therapies. Each use different mechanisms to boost or restore the immune system's fight against cancer. Those that are designed to enhance pre-existing immune responses, known as passive immunotherapy, tend to use agents like monoclonal antibodies and cytokines. Such drugs tend to have a short-life. By contrast active immunotherapy, which is designed to stimulate a patient's immune response against tumour cells, have a more durable effect. The treatment is often called a cancer vaccine. Cancer vaccines difer from traditional vaccines used to prevent infectious diseases. Their intended goal is not to prevent disease, but rather to stimulate an active immune response against the cancer. CAR T therapy is an example of such treatment. While immunotherapy for cancer has travelled a long way since its early beginning, advances in the field have not been straightforward and major issues still need to be resolved. Scientists are still a long way from understanding why some patients benefit more than others from the treatments and overcoming their potentially serious side effects, some of which can be fatal. It has also only so far proven of use for certain types of cancer. Only about a third of all cancers are amenable to treatment by the immunotherapies so far appoved by the FDA. In addition the treatments remain highly expensive, which poses questions about how far society will be willing to pay for them. This section draws extensively from Lara Marks, 'The changing fortune of immunotherapy', in L. Marks, ed. Engineering Health: Biotechnology and Medicine, Royal Society of Chemistry, forthcoming, Sept 2017.